I was initially drawn to Shu Uemura as their line of cosmetics and skincare evokes a very fresh and fun sense towards their sleek and simple packaging as well as their high-end quality formulations. My combination/oily skin tone can never ever last whole day, with just makeup applied, without showing the slightest hint of shine along my T-zone. Hence, a light dusting of powder to the skin is one of the essential products I use to control oil and leave my skin looking matte and shine-free during most of the day. I’ve been using Shu Uemura Powder Foundation Natural Glow Finish SPF20 PA++ since I purchased this beauty a while ago and I have recently just touched pan! Shu Uemura Powder Foundation Natural Glow Finish SPF20 PA++ contains 13g of product and you can purchase the powder casing, which comes with an in-built mirror and sponge applicator, in the original black or white case or even one of the limited edition designs which launch every now and then during the year. I decided to purchase the black casing as it looks very sleek and won’t get so dirty as easily as the white case. The finely milled powder can be applied directly onto the skin alone using the sponge applicator or as a mattifying powder after liquid foundation application using a large fluffy powder brush. I tend to apply this powder using a large brush as the powder controls oil very well and give my skin a nice healthy matte-finish without ever looking cakey or heavy. I always opt for powder, which contain SPF to protect my skin from the harmful sun rays, so I’m glad this powder contains SPF 20. The formula of this powder is water-based, as opposed to oil-based powders, which are prevalent in the beauty industry. The powder applies on evenly and I only use small amounts (i.e. lightly swirling the brush back into the pan once) for each application, so it has lasted me about 1 year until I finally hit pan! Overall, Shu Uemura Powder Foundation Natural Glow Finish SPF20 PA++ helped to control my oily T-zone and it’s high SPF is a huge plus for this powder. 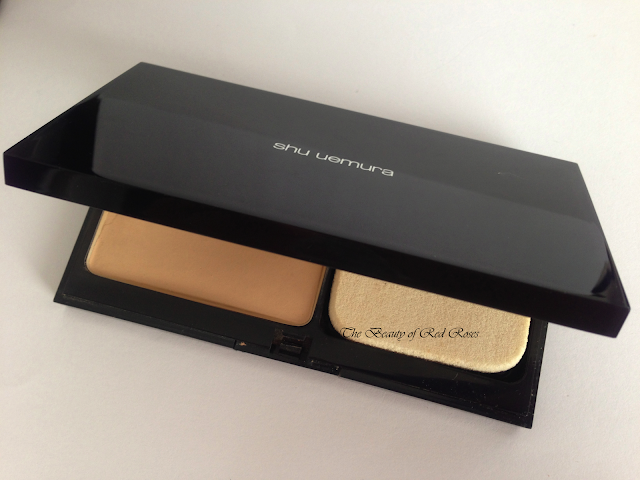 The finish of this powder gives a lovely, natural and light matte finish, which suits my skin tone and type perfectly. This powder has actually been discontinued, which is really sad, so hopefully Shu Uemura will launch an equivalent or even better powder so that I could play with! What is your holy grail powder foundation?